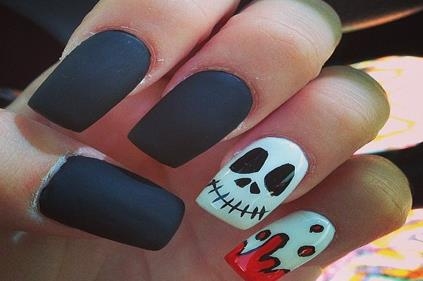 In the list of Halloween nails, this is one of cute halloween nails. Mummies are a scare thing, no doubt, but this will add a tint of cuteness to your nails. Try this, this halloween. The other hand’s nail are completely opposite, with only black color. Eyes are visible of these black ghosts. For making this design make strips of black and white on some fingers. On one nail, you need to be creative. See the picture to get the right idea. Make a web which is a bit thick. This thickness gives this halloween nail design a bit 8 bit games look. Bats are associated with halloween as no other things. In fact, bats are always there when you are scared. These halloween nails are easy to make and don’t require much expertise. 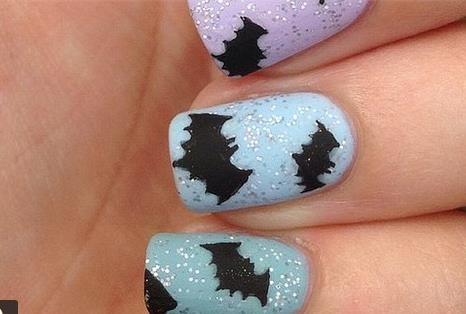 Apply a base color, and then make bats with the black nail polish. Blood is associated with Dracula. When you look something like blood dripping, it gives us a shiver in our spine. The blood with blackish tone scares one psychologically, because we all have heard stories involving blood suckers. 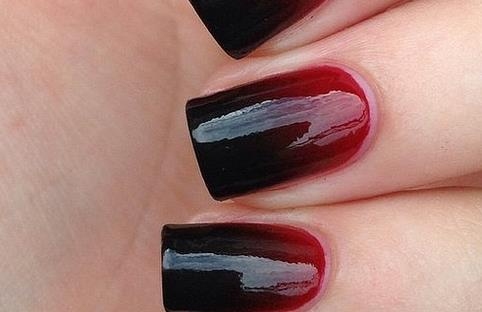 Just apply red polish and recoat it with black one leaving some red portion to get this halloween nail design. You must have seen the effect of looking at scary hands in movies. A close up shot of hand tells the whole story. This one of halloween nails, takes inspiration from movies. You need to get fake pointing nails. Apply some red color to show blood. The grim is a personification of death. It has become more famous with animated television series, Billy and Mandy. Billy has a friend who is the grim reaper. Who has a scythe in his hands. He does extraordinary feats with it. These halloween nails, were inspired by this theme. 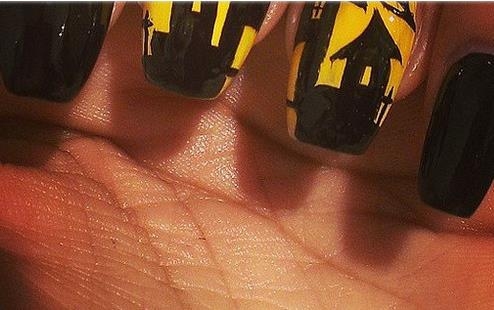 This halloween nail design will blow your mind. It is the one of ugliest but most creative of halloween nails. You can make this with some effort. Usually this will take a professional designer to give this effect. The nails although fake, were cut randomly to give them spooky dead finger look. The texture of color used to show blood is so real that it gives you creep. This is really not easy halloween nails, and requires you to take help of an expert. This is a combination of sci-fi noir and scary hands. The enigmatic and strange pattern on the fingers gives a mysterious look. The pointed nails on the other hand, make them look frightening. You may make take fake nails or file them to pointed shape. 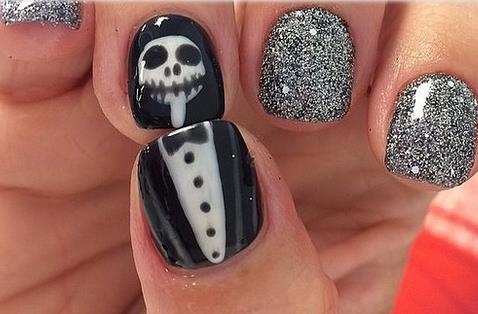 Paint white and black as in the picture to create these halloween nail designs. No spooky story remains complete without the zombies. Zombies are such a favorite personalities that they remain popular even after death. 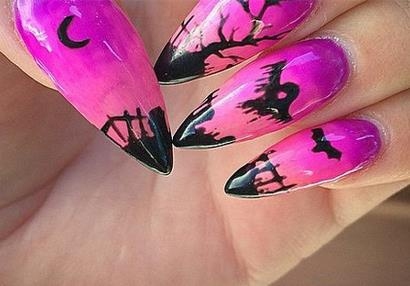 To celebrate the importance of zombies this halloween nails make another great halloween design. These zombies are a bit cute and fall in the category of cute halloween nails. It is perfect for little girls. Pumpkins and Halloween are inseparable. This halloween nail design celebrate this association. It requires a bit of artistic creativity and perfection. The spider here is a bit funny, but it goes with the spirit of the festival. This is one cute halloween nails. You can add a tint of yellow color to turn these pumpkins into lanterns. The horror movies usually have one or two car accidents in them. Some have mysterious murders. The Police insignia to cordon off the area is a symbol easily recognized. You usually watch these movies on festival’s eve. 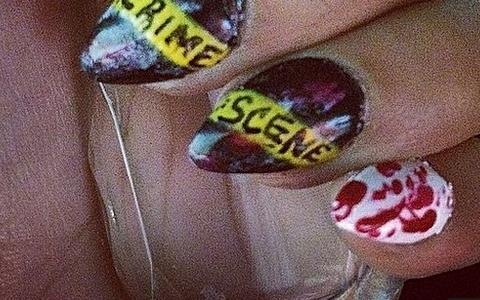 These halloween nail designs make a short film with your nails. 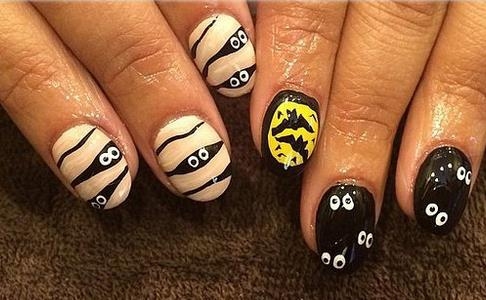 This is one of most creative of all halloween nail art. The horror movies and animated series have one thing in common. They create magic with lights and colors. Different colors evoke different emotions. 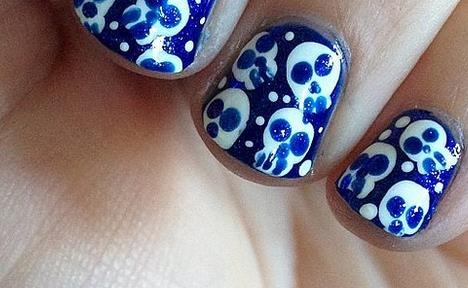 These beautiful halloween nails take that motif and turn it into nail design. The purple color with haunted images of trees, bats, cemetery and ghost make a perfect scene of horror movies. Another of popular scary figures is a skeleton. Skeleton keep lurking here and there in the movies, to devour humans despite the fact that they don’t have stomach. But any way they create lot of frightening moments in movies and cartoons. Cherish this skeleton man with these halloween nails. Use thick black color on three nails and draw the skeleton figure on the fourth one. The fifth one shows what our skeleton man had for dinner. 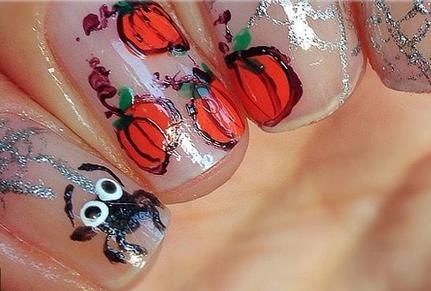 This is an example of easy halloween nails art. Aliens are already scary. When you combine them with halloween they become more spooky. These alien ghosts with their bright colors will make your nails stand out among your friends. This nail design is very bright and creative. It requires a bit of painting skills. Apply a base of dark yellow color and then make haunted house with the black polish. 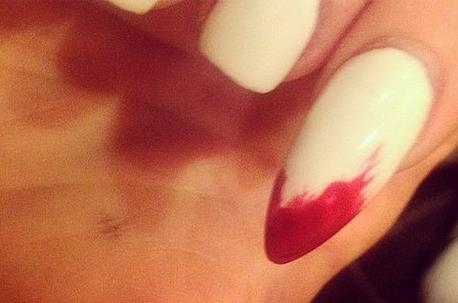 The other nails are in complete eclipse adding to the horror of the scene. It surely is a gem in halloween nail art. Halloween is a festival that is famous world over. Artists keep finding new ways to celebrate this festival. Nail art is the latest fad which has taken the world with storm. 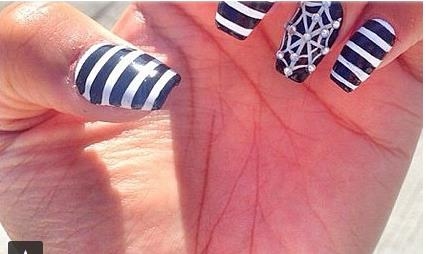 Nail art is synonymous with women makeover, but man can also use these nail designs to augment their halloween costumes. Now, nail artist are making themes that are relevant with the festivals. You can make halloween nail art of your own. One needs a lot of creativity. Use the motifs and themes associated with Halloween. Blood, vampires, ghosts, bats, haunted house, jack-o’-lanterns, apple and similar symbols are powerful halloween themes. Some of these are easy halloween nails while the other require professional touch. With these themes one can draw spooky and frightening designs.